Pietro Roccasalva says he doesn’t believe in chronologies, at least not where his work is concerned; every image or idea that arises is the reflection of another that came just before it or a premonition of one to follow. He likes to think of his oeuvre as ready-formed – a magnificent hall of mirrors. Nevertheless, once in a while, things just appear from the ether. In 2002, the Italian artist had a vision. I ask him if this happens often. ‘No, not often,’ he replies.1 But there it was: a church, seen from the air, its mighty cupola replaced by the turning dome of a giant lemon-squeezer. To be fair, it hadn’t come from nowhere. The Milan-based artist had been working in the deconsecrated Chiesa San Francesco, in Como, Italy, on a residency. Roccasalva imagined the building pressing juice from giant, ineffable fruit, and retaining the liquid in its nave and transepts. Giocondità (2002) is a digital animation of this majestic image: to the sound of a marching band, the virtual camera swoops out and around the immaculate white church while its lemon-squeezer dome revolves slowly above it. One day, he says, he would like to build this church for real. I don’t think he’s joking. Roccasalva showed the video along with a related drawing in a wooden-walled booth inside the church, in an installation he titled Messaggerie Musicali (Musical Messages, 2002). He refers to his installations as situazione d’opera or ‘worksites’ – open stages in which disparate elements converse with each other, and are very likely to be reconfigured by the artist at a later date.2 A year later, he found himself returning to a single photograph of this installation: the back of the booth framed by one of the church’s Romanesque arches. He made a precise pastel drawing from the photograph, as he often does with documentation of his installations. In the upper section of the image, a circular window, flooded with light, seemed to the artist more and more like a single eye, peering back at him; he decided to plunge through it. He cut away the circle in the paper, and constructed an installation in a derelict hotel bathroom titled Jockey Full of Bourbon (2003), in which the window became a peep-hole through the wall on which the drawing was hung. Visitors were able to peer through the hole to see another bathroom, with the inverse layout to the one in which they were standing. At the centre of this image, however, perched a brightly coloured bird looking into a mirror. Its reflection stared straight back: a stuffed owl, painted in the gaudy colours of a scarlet macaw. In Classical mythology, the owl is the companion to the Greek goddess Athena, and her later Latin counterpart Minerva; both are goddesses of wisdom. The parrot, on the other hand, has long been thought of as a trickster: a canny imitator of human speech, which it repeats without sense or discretion. In contrast to the owl’s penumbral associations, the macaw has been linked – in South American cultures – to fire and solar energy. Both birds were believed to be ‘psychopomps’, escorting souls from the land of the living to the land of the dead. Roccasalva refers to the bird in his installation as ‘a philosopher dressing itself as a sophist’, an analogy that reminds us that ‘sophist’ derives from the ancient Greek sophistes – a professional wise man or rhetorician (a role not so different from that of the contemporary artist). Wisdom and fantasy are not so easily disentangled. Following the installation of Jockey Full of Bourbon, Roccasalva took a photograph through the spy-hole in the drawing; in his image, we see the owl–parrot in the mirror and the decorated ceiling of the church, but also the light reflected on the glass of the picture’s frame, and the shadowy outline of the photographer himself. Spatially, the compositional elements are almost too complex to grasp simultaneously. Roccasalva then made a pastel drawing from the photograph, and used it as the nucleus of a tableau vivant in which a woman sat facing the drawing, while a young girl rested her head on the woman’s shoulder, coolly regarding visitors to the gallery. Why, then, was the girl dressed so strangely, with a thicket of tangled hair and alarmingly long fingernails? Anyone raised in Germany will recognise her as a female incarnation of Der Struwwelpeter – the titular character from Heinrich Hoffmann’s 1845 collection of children’s tales, who neglected to brush his hair or trim his fingernails. 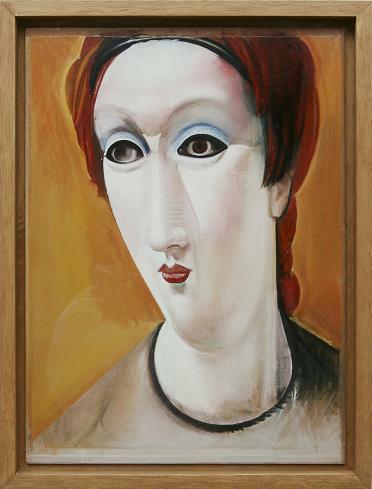 The unkempt character’s change of gender, and her distinctly entropic relationship with her well-groomed mother, both demonstrate that reflections, neither in art nor in life, occur solely at an optical level. The installation from 2005 was titled The Oval Portrait. A Ventriloquist at a Birthday Party in October 1947, implying a further host of associations. ‘The Oval Portrait’ is the title of a short story written by Edgar Allan Poe in 1842, describing a painter who creates such an exquisitely lifelike portrait of his beautiful young wife that he steals her soul, and inadvertently kills her as he puts the finishing touches to his work. Roccasalva’s tableau vivant, in contrast, employs two living people as an art work. The second half of the title repeats, verbatim, the title of a Jeff Wall photograph from 1990 in which children sit, rapt, around a woman on whose knee rests a ventriloquist’s dummy. Once again we encounter an insensible object seemingly come to life, though frozen by the static composition of Wall’s posed photograph, and reanimated by its translation into Roccasalva’s living picture. 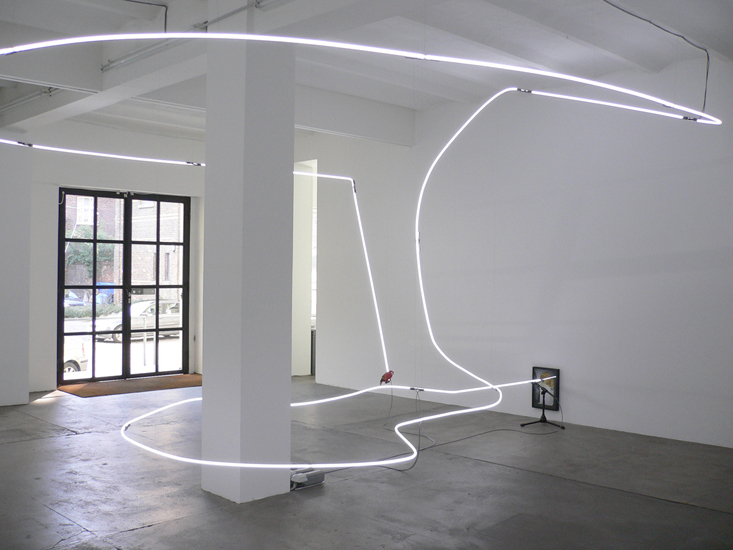 When Roccasalva showed Jockey Full of Bourbon in 2006, and a year later at Manifesta 7, the hole in the drawing had been blocked up, and, instead, a tube of white neon snaked out from it into the gallery, sweeping twice around a column before returning to the ground near the drawing. On the end perched the little owl. Only the most observant viewer would have noticed that the trajectory of the neon precisely followed the movement of the viewpoint around the church in his animation La Giocondità (2002). It was, in effect, a journey of optical enquiry played in reverse, the drawing throwing its gaze out into the room. Jacques Lacan famously advanced the idea of vision as a reciprocal process between a subject and the object of the gaze, a theory that emerged from his work with infants’ relationships to mirrors. ‘You never look at me from the place I see you,’ read the violet neon letters in Roccasalva’s installation Z (2008). The complaint was, initially, Lacan’s, who wrote that, ‘in the dialectic of the eye and the gaze […] there is no coincidence, but on the contrary, a lure’.6 In Roccasalva’s installation, the neon sentence turned halfway through and played backwards, right to left. The corrected letters could be read in a mirror on the opposite side of the room. 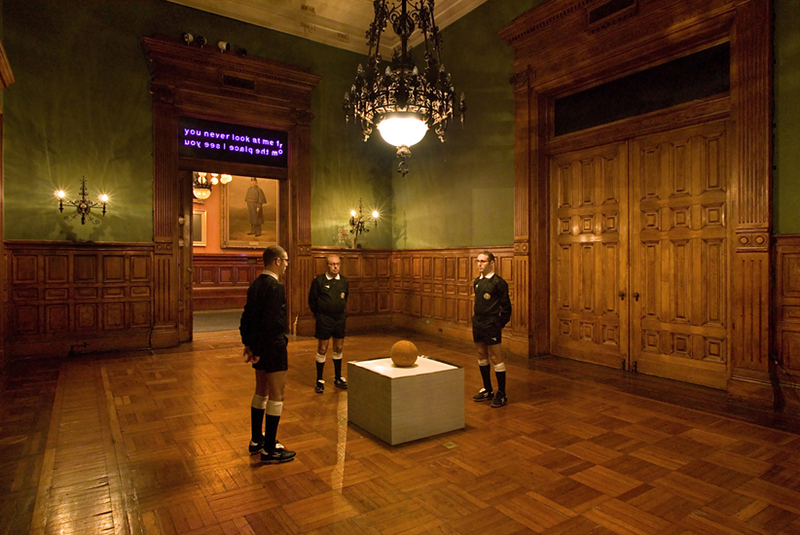 In between the neon letters and their reflection, three uniformed football referees guarded a stack of square, black-bordered paper, on top of which sat a crusty orange sphere, about the size of a football. The object was, in fact, a massive arancino, a Sicilian snack made of fried rice, and the printed sheets of paper referred to the black-edged obituary notices traditionally posted in Italian town squares. The three men resembled one another: in fact, one was the exhibition’s curator, the other his twin brother, and the third their father. They supervised what Roccasalva conceived as the slow collapse of an edible sun: not so much a ‘still life’ but, as it is termed in Italian, a natura morta. (Elsewhere in Roccasalva’s iconography, the sun has been codified as a red vinyl record, a canister of film and a red plastic bucket.) Before entering the room, the viewer passed a gilt-framed, near-black monochrome in the hallway, titled D’après La Tempesta (After the Tempest, 2006). Working with a restorer, he had managed to isolate every colour in Giorgione’s ominous but persistently enigmatic painting La Tempesta (The Tempest, 1506–8), and then mixed them together to create an even darkness. This was Roccasalva’s depiction of permanent night, the end of time, the absolute future. That an object can gaze back at a subject is a fascinating conundrum for Roccasalva, and one that continues to inform not just his understanding of space, but also of time. ‘History’, he says, ‘is only an illusion of perspective.’ A related spatial analogy he often turns to is that of the reverse perspective found in Christian icons. As the art historian Clemena Antonova has argued, the primary characteristic binding all icons is the way their makers organize space in direct opposition to post-Renaissance linear perspective.7 Heads, for instance, are unusually round, as we are shown their sides as well as their fronts, and thrones often grow wider as they recede. In such cases, the viewer is not credited with a disinterested, detached relation to the image (as if seeing the world through a window), but is assumed to belong in the same pictorial space – and thus becomes the focus of the image, rather than vice-versa. Similarly, says Roccasalva, the spectator is always ‘an intruder’ into the worksite. According to the artist, the only way to approach his art is to surrender oneself to rapimento, a word that translates as ‘rapture’ or ‘ravishment’, but also as ‘kidnapping’ – in either sense, the viewer is the passive agent in the exchange. Roccasalva himself quotes not Faulkner but Pink Floyd, in the lyrics from their song ‘Time’ (1973): ‘And you run and you run / To catch up with the sun / But it’s sinking / Racing around / To come up behind you again.’11 The sun, a symbol so consistently returned to by the artist, is subject to a whole slew of perceptual antinomies: although the gravitational centre of our planetary system, seen from outer space it is just another smallish star. Its reflected light is essential for vision, but we can’t look at it directly. We set our clocks by it, but its birth and death effectively mark the beginning and end of human time. For Roccasalva, the entire universe is a vast mise-en-abyme, bounded by nothingness and gradually moving towards disintegration. In this system, the artist, like an owl, a referee or an elevator operator, is a psychopomp, burrowing through dimensions and ferrying objects and ideas between the living and the dead. As such, he may be constantly chasing his tail, but he is compelled by the persistent notion that making art might be the one activity with the power to reverse the process – to contravene the laws of time, to preserve the decaying and bring life to the dead.